Five Members of Parliament across party lines today published their declarations of assets and liabilities in public. MPs Tharaka Balasuriya, Vasudeva Nanayakkara, MA Sumanthiran, Vidura Wickramanayake and State Minister Eran Wickramaratne were at the event. Transparency International Sri Lanka campaigned for many years to bring this information into the public domain, believing that greater openness by public representatives increases trust and ensures stronger accountability. Speaking at the event MP MA Sumanthiran highlighted the importance of declaring assets. 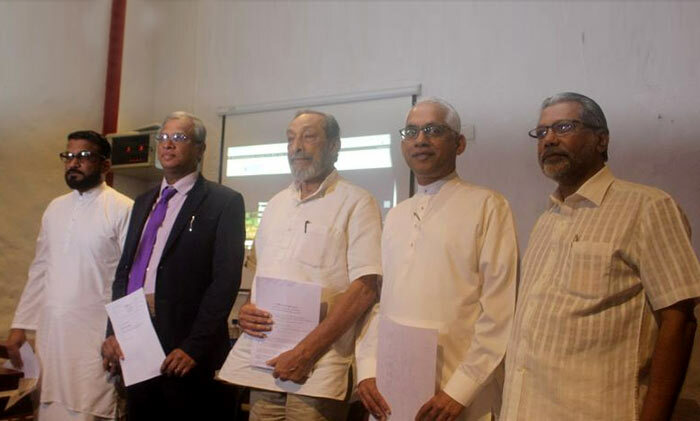 State Minister Eran Wickramaratne said the 19th Amendment to the Constitution was introduced with the only reason of increasing the number of Cabinet Ministers. The State Minister noted if assets are being declared by a Minister is it has to be presented to the President and if it’s not a Minister it has to be presented to Parliament. State Minister Wickramarathne stressed the President is vested with the power of whether to reveal the details in the report or not. The State Minister claimed certain tricks are used in Parliament adding a recent one was that when the 19th Amendment was implemented, parties joining hands were allowed to establish a National Government. He said it was a tactic to increase the number of Cabinet Ministers to more than thirty. Speaking at the event United People’s Freedom Alliance Parliamentarian Vasudewa Nanayakkara said the travel allowance granted to certain MPs is insufficient to cover fuel costs. The Parliamentarian meanwhile admitted he sold his vehicle permit and earned a profit. Speaking at the occasion, Executive Director Transparency International Asoka Obeyesekere said, “We commend the bold step taken by the five members of parliament to submit their asset declarations to the people. Whilst this marks a significant milestone in the campaign to bring politicians’ asset declarations into the public domain, we also hope that this step will encourage other public representatives to recognise the unquestionable public interest that is served by disclosing this information”. All JVP and TNA MP’s should follow suit. The Blue, Green and Pohottu will never join. That is where all the illegal komis and black money lies. There are statutes and mandatory declaration requirements on all Political leaders and Public Servants. Even the declarations submitted to the King’s Office are never read. We are more corrupt than the worst corrupt African countries. I am disappointed that OnLanka has taken this important item out of the current news item list. Perhaps Onlanka will reconsider and make this current for comments/discussion !! Thank you Pierre for your comment. It appears that there has been a blatant dereliction of duty on the part of the Commissioner of Elections ! President Sirisena should take action on this matter. Over to you Mr President.